Annie with her son Travis at the walk. The Allied Group raises money each month with their “Jeans Tuesday” campaign. All employees that wear jeans on Tuesday, contribute dollars that then gets turned around and used for various local charities throughout the year. 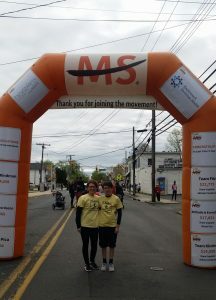 “April we supported Annie Dix and her best friend Janet in the walk for MS in Belmar, NJ. We wish her and all those people and families that struggle with MS each and every day the very best. Every little bit counts, and we were happy to be able to support the cause,” Robert Smith, CEO of The Allied Group adds.